At the premiere of its International Injection Molding Conference (IIMC) at the beginning of December 2014, the organizer, Aachen Institute of Plastics Processing (IKV), put its focus on automotive applications. The next IIMC, which takes place from September 30 – October 1, will have a different application focus than the automotive industry. More than 100 experts from 15 countries attended the two-day program last year. Nearly two thirds were from abroad, 20 of them from Asia. Dr.-Ing. Peter Urban, Deputy Head of the Aachen Institute of Automotive Engineering (ika), kicked off the 2014 conference by outlining the main challenges currently facing vehicle development and their consequences for plastics technology. The efforts to reduce CO2 emissions and to deploy alternative drive systems were naturally generating significant potential for plastics technology in the lightweight construction of the vehicle body and outer skin. He said there was also strong demand for crash-deformable battery packs with a thermoset injection molded cover and local reinforcements that were suitable for large-volume production. Dr Urban also sees promising opportunities for plastics technology in the trend towards automation: A big challenge for self-propelled systems comes from the many different sensor systems, especially optical sensors and their integration into the outer skin of the vehicle. On top of this, he said, potential also exists in the field of “connected driving” with the levels of navigation, guidance/assistance systems and stabilization. Prof. Dr.-Ing. 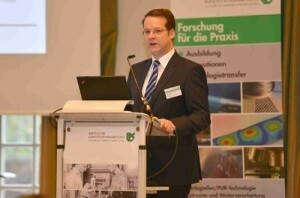 Christian Hopmann, Director of IKV, presented the main areas of research in injection molding and mold-dependent fiber composite technologies at his Institute, and also took a look at the latest trends in plastics technology. He also underlined the potential of liquid silicone rubber (LSR) in lighting applications. Its excellent UV stability and heat resistance makes it ideal for use in transparent optical systems. This aspect was also highlighted by Heiko Bayerl from LSR manufacturer, Momentive Performance Materials. The low viscosity of LSR, said Prof Hopmann, also made it possible to directly mold liquid silicone onto LED boards. He also underlined the potential of processes supported by dynamic temperature control: Creating antireflection finishes, overcoming long flow paths and reducing the consequences of weld lines were only a few examples of the many advantages. Moving on to the topical subject of lightweight construction, Prof Hopmann sees greater overall potential in the foaming of plastics for weight saving than in using carbon fiber reinforced plastics (CFRP). Dominique Manceau, Head of the Innovation Department at Plastivaloire, underlined the advantage of inductive heating of the molding tool for the representation of a variothermal foaming process. Steve Braig, CEO of Trexel, which supplies the “Mucell” physical foaming process, reported on a joint project with 3M, in which hollow glass spheres in the physically foamed polyamide (PA) 6 melt had led to improvements in the mechanical properties as well as weight reductions. The inaugural IIMC also touched on the topic of generative production processes. Prof. Hopmann sees much greater potential for the industrially used 3D technologies in mold design for injection molding and the sintering processes for mold inserts than for the 3D generation of plastic parts, even though this process may be worthwhile in individual cases.